**I don’t have a good picture of these yet, so if you make them send me a pic and I’ll replace mine! This recipe is from nutritionist Emily Harrison, a former dancer who works with dancers. The energy bites are easy to make, endlessly customizable, and each one packs an energy punch. Great for grabbing in between classes while you change shoes or combining with a piece of fruit for a complete snack. 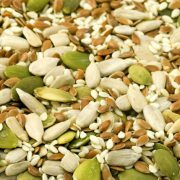 Blend up raw pumpkin seeds and rolled oats in the blender; you can use half this mix as a filler in the energy rolls recipe and half as what you will roll them in at the end to prevent sticking. Now it’s time to get creative by adding ingredients that make you happy and mixing them all up to create a batter that sticks together when you roll it into a little ball. (These rolls are super flexible and customizable). In a large bowl combine whole roasted pumpkin seeds with the seed butter. Then added rolled oats, chia, hemp, and flax seeds. Sweeten with added honey, raisins, and Goji berries. Then added ground up buckwheat cereal and half of the mixture of seeds/ oats that you made at the beginning. Bonus points if you add cacao nibs. Extra bonus points if you add grated ginger. Tip: wet hands with water before rolling to make it easier. Roll the balls in the dry seed/oat mixture to prevent from sticking to each other and everything else. Refrigerate to firm up. Energy bites will keep outside the fridge for many hours and can be customized in any way that works for you. 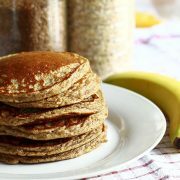 These pancakes use no flour or added sugar and are easy peasy to make. Blend all ingredients in a blender. Drop small pancakes onto buttered skillet. Cook till small bubbles form on top of pancakes, then flip and cook 1-2 more minutes.